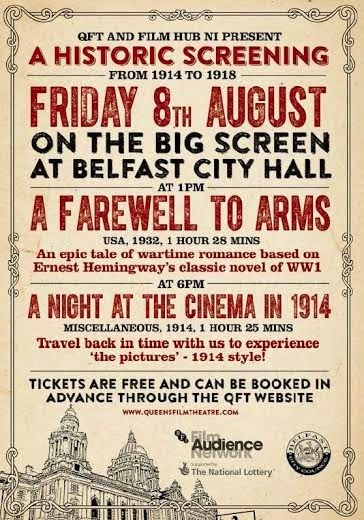 Belfast Somme 100 Autumn Programme launch! 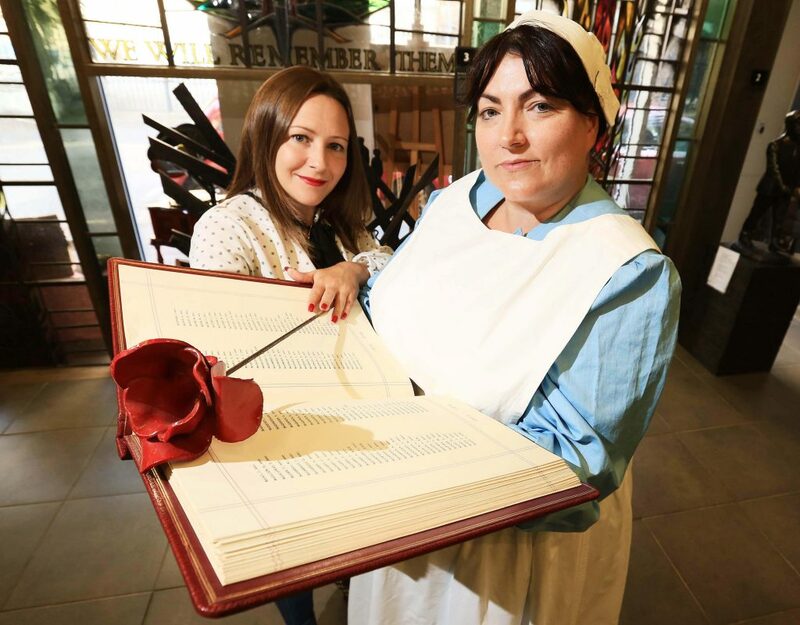 At the launch of the September – November Belfast Somme 100 programme, pictured from left: Karen O’Rawe, Chair of History Hub Ulster, and Antoinette Morelli, who stars in ‘Medal in a Drawer’ which runs in venues across Belfast from 27th – 30th September. History Hub Ulster today launches it’s Belfast Somme 100 September – November 2016 programme of commemorative events marking the centenary of the battles of the Somme, and the place of the Somme campaign within the First World War. 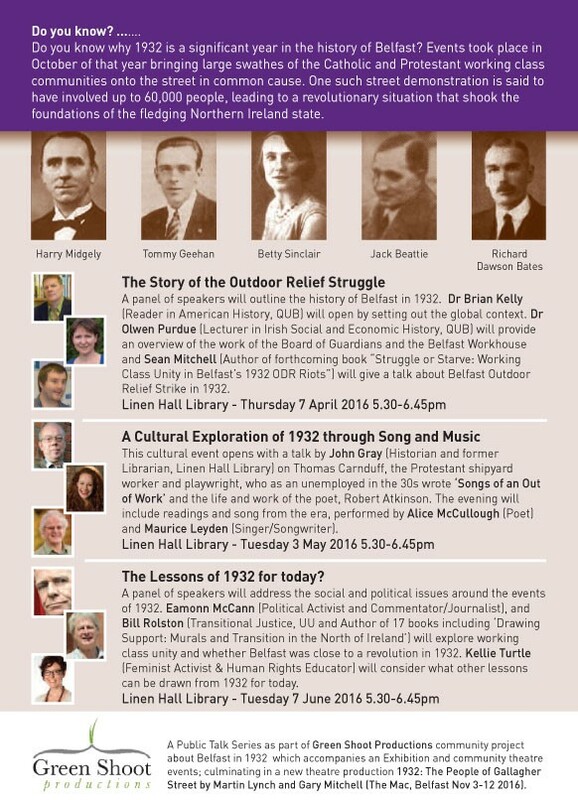 ‘The impact of the Somme on Belfast is remembered in this, our final programme of events. The people of our small city heaved with tears of grief as their young men were killed and maimed, no matter what their background. Belfast Catholic, Protestant, Jew or Quaker – all served and died together at the Somme. The close links between people can be seen in our programme of events. Follow Rifleman Willie Kerr, a young Catholic man who enlisted in the YCV in MEDAL IN THE DRAWER. See his friend, young Protestant Rifleman George Kirkwood on the big screen at City Hall as part of the CASTLETON LANTERNS Project. DR JOHANNE DEVLIN TREWE will give a lecture on the service of local nurses, like George Kirkwoods sisters Charlotte and Mary Ellen. The Kirkwoods and Kerrs were just two Belfast families who received telegrams announcing the deaths of their sons. NO NEWS IS GOOD NEWS takes us back to a village waiting, with dread and hope, for any news from the front. The project focuses on the personalities and stories associated with the campaign and mark its place in the social and political history of Northern Ireland and pre-partition Ireland. The Belfast Somme 100 project aims to raise awareness of previously overlooked or submerged stories and personal connections that both the Somme and the events of 1916 have had with the broader history and development of Northern Ireland. The programme runs for 141 days across Belfast, the exact duration of the Somme campaign in 1916, and this Autumn it features a range of commemorative events including concerts, film, lectures, walks, exhibitions, poetry, debates, theatre, children and family activities. ‘Medal in the Drawer’, a play by Brenda Winter Palmer which follows four volunteers from Belfast on their war-journey; The Year of the Somme: 1916 in Perspective conference in partnership with the Western Front Association which features a ranges of local and international speakers; Artists at the Somme with the visual artists, poets and musicians at the Ulster Museum; a series of talks at the Linen Hall Library; ‘No News is Good News’ a new play Philip Orr, will form a Kabosh promenade production at the Ulster Folk & Transport Museum and take you back 100 years  to meet the villagers who were desperate for news and awaiting telegrams from the front; a season of films at the Queen’s Film Theatre; Castleton Lanterns, refound images of servicemen after 95 years will be shown on the Big Screen at City Hall; The 1916 Centenaries, An Opportune Time for Reflection?, Hedge School in partnership with the Fellowship of the Messines Association, Battle of the Somme Centenary Concert at the Ulster Hall; and the programme culminates with a Keith Jeffery Memorial Lecture by Margaret MacMillan, Professor of International History at the University of Oxford. 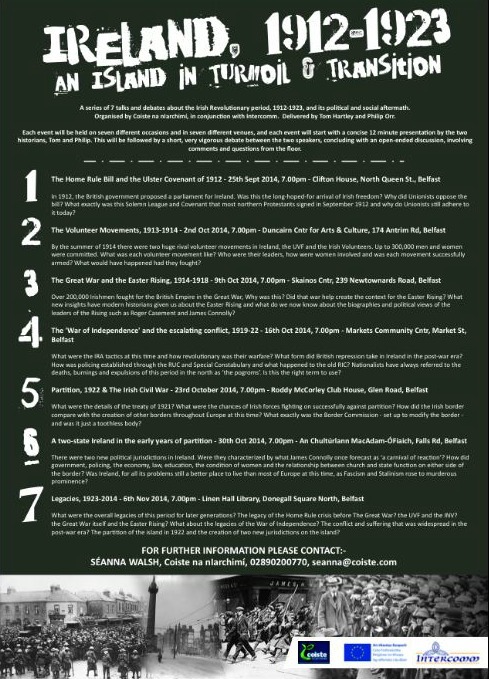 Local events throughout Belfast will continue through till the end of November. Activities will include the opening of a new memorial and lighting of a beacon at Skegoneill Avenue in November, a Somme Day Community Festival to launch Tree Tank in South Belfast, the ‘Row on Row’ remembrance event at Pitt Park on 18th November and a new activity and learning book on the Somme to be circulated free to schools and community centres and interactive workshops aimed at educating children and young people. Belfast Somme 100 is run by History Hub Ulster with an Advisory Panel made up of experts in the period and community leaders. It is funded by Belfast City Council. Full information, updates and ticketing is available at www.belfastsomme100.com, on Facebook and on twitter @belfastsomme100.